Variables Affecting Wind Turbine Power (Lesson 5) | CE - Clean Energy. Bright Futures. 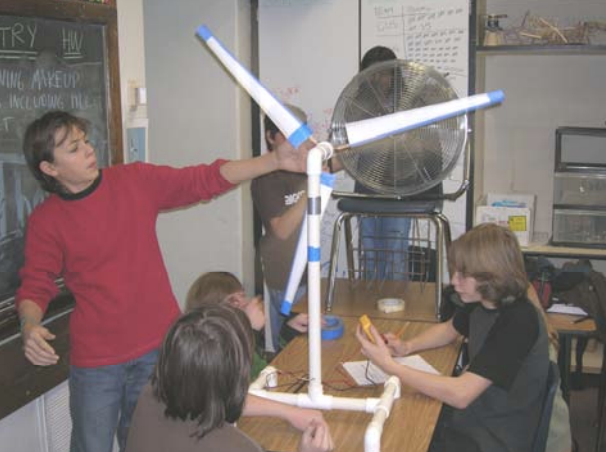 Now that students are familiar with how mechanical electricity generation works, they will build a wind turbine powered by a box fan. Different teams will test different turbine variables to see how the amount of electrical power is affected. After each team completes testing their chosen variable, the highest wind turbine configurations from each team will tested against one another. The turbine that generates the most power from this lesson will then compete with a photovoltaic cell of approximately equivalent cost to see whether wind or solar is the most economical (in the next lesson). Want to upload a new activity?